According to the post Kosuke Takahashi, correspondent of the magazine IHS Jane’s Defence Weekly, Mitsubishi Heavy Industries (MHI) announced on 1 November that it has been awarded a contract by the Japanese Ministry of Defense (MoD) to build the first two of four ships of a new class of multirole frigate for the Japan Maritime Self-Defense Force (JMSDF). Although MHI did not disclose the value of the contract, the MoD had earmarked JPY92.2 billion (USD816 million) in its budget for fiscal year 2018 for the construction of the two 426-foot/130-meter-long, 42.6-foot/13-meter-wide frigates, which are expected to be handed over to the JMSDF in March 2022. In August the MoD requested JPY99.5 billion from Tokyo for the construction of the two remaining vessels, with delivery expected to take place in March 2023. However, the contract for these two ships has yet to be awarded. 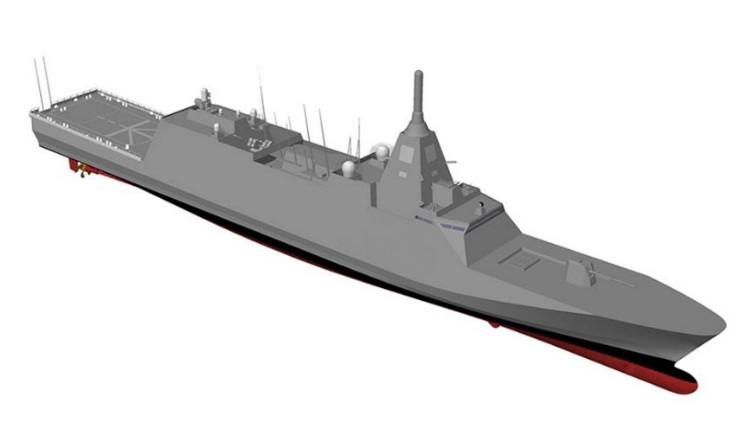 MHI’s frigate design and proposal were selected over those submitted by Mitsui Engineering and Shipbuilding (MES) and Japan Marine United. MES, however, was chosen to be the subcontractor. Construction of the first 3,900 tonne ship will take place at MHI’s Nagasaki Shipyard & Machinery Works in Nagasaki Prefecture, while the second one will be built at MES’s Tamano Shipyard in Okayama Prefecture. The arrangement marks the first time that MHI will build a ship as the lead contractor. Armament on the frigates, each of which will be capable of embarking one helicopter as well as unmanned surface and underwater vehicles, is expected to include the navalised version of the Type-03 (also known as the «Chū-SAM Kai») medium-range surface-to-air missile, a 5-inch (127-mm)/62-calibre gun, a Vertical Launch System (VLS), canister-launched anti-ship missiles, and a SeaRAM (Rolling Airframe Missile) close-in weapon system.